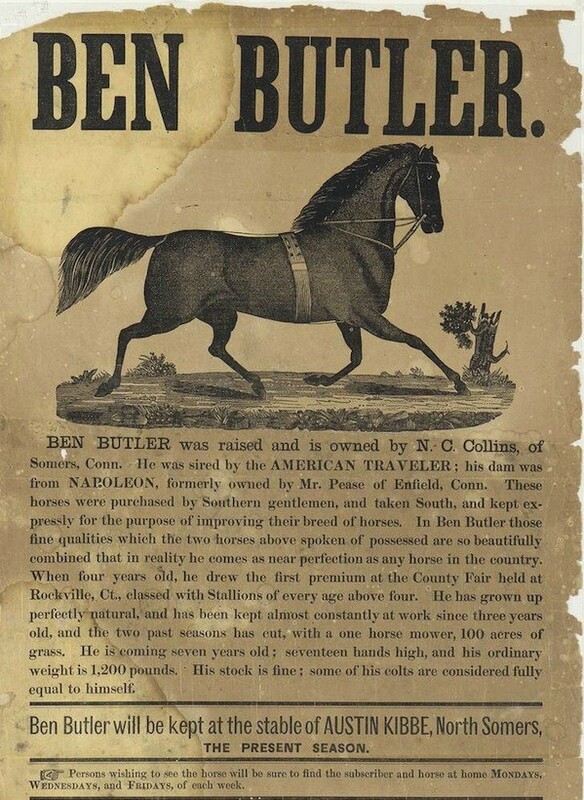 A foal born on a farm owned by Noah C. Collins on Pink Street (now Springfield Road) became one of the most famous residents of Somers, Connecticut, and a legendary figure of the Civil War. 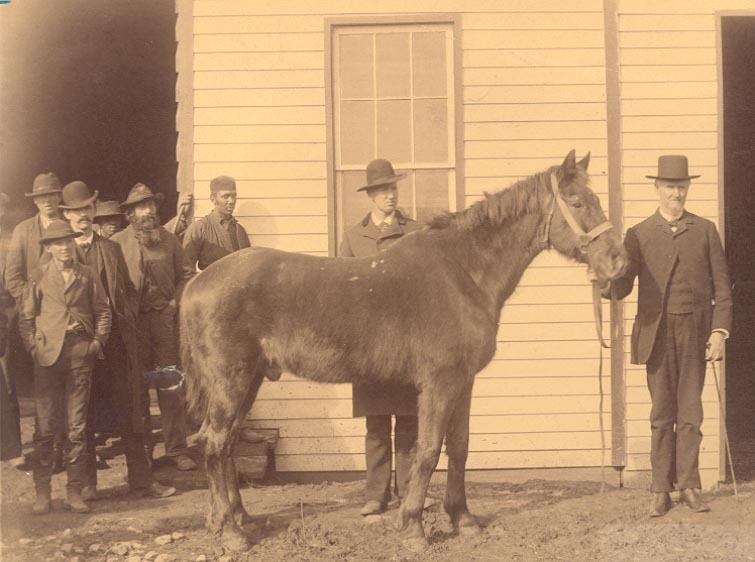 That horse, later known as Little Sorrel, grew up in Somers but earned fame as the mount of Confederate General Thomas J. “Stonewall” Jackson. As Jackson’s trusted companion, the steed carried him into some of the most well-known battles in US history. Little Sorrel’s wartime service earned him a place of honor at the Virginia Military institute and, in 1990, his hometown of Somers named a street after him. Little Sorrel began his military career after being purchased by the Northern government for use in the Civil War. In 1861, he and a number of other Union horses landed in Confederate hands when Southern forces at Harper’s Ferry overtook their transport train. After reviewing the newly captured prizes, General Stonewall Jackson selected a pair of chestnut horses for his own use. He intended to keep the larger of the two for military purposes and named that horse Big Sorrel. (Sorrel is a commonly used descriptive term for horses with reddish or chestnut colored coats.) The smaller of the two was given the name Fancy and was to be sent to Jackson’s wife Mary Anna as a gift. Within a matter of days, however, Jackson recognized that Big Sorrel frightened easily and did not have a disposition suitable for battle. Fancy, on the other hand, proved to be a much calmer and more reliable horse. Jackson changed Fancy’s name to Little Sorrel and the horse from Somers became his mount for the remainder of the war. Little Sorrel was a Morgan horse, a descendant of the original Justin Morgan horse born in Springfield, Massachusetts, in 1789. Morgan horses were known for their endurance as well as for being quick and agile. This made them a favorite of Southern soldiers in the Civil War and cowboys in the American West. Morgans had short legs, stocky bodies, and few problems with their legs and feet when compared to other breeds. Most importantly, however, their famously calm dispositions made them ideal horses to take into combat. Jackson rode his new horse into some of the most famous Civil War battles, including Sharpsburg and Fredericksburg, and it was Little Sorrel who carried Jackson on the fateful day in 1863 when friendly fire mortally wounded the General at Chancellorsville. After Jackson’s death, Little Sorrel briefly lived with Jackson’s widow before moving to the Virginia Military Institute and then the Confederate Soldiers Home at Richmond’s Robert E. Lee Camp. After years of making appearances at county fairs and Confederate soldiers’ reunions, Little Sorrel passed away in March of 1886 at the age of 36. Shortly after, he was given to a taxidermist, who mounted his hide on a plaster model. Little Sorrel was put on display, first at the Soldier’s Home in Richmond and later at the Virginia Military Institute where he remains today, behind glass. It was not until 1997, however, that Little Sorrel’s bones were cremated and interred on the Virginia Military Institute’s parade ground in front of a statue of Jackson.